2. Healey MG. Acardia: predictive risk factors for the co-twin’s survival. Teratology 1994;50:205-13. 3. Tsao K, Feldstein VA, Albanese CT, Sandberg PL, Lee H, Harrison MR, Farmer DL. Selective reduction of acardiac twin by radiofrequency ablation. Am J Obstet Gynecol 2002;187:635-40. 4.Simpson PC, Trudinger BJ, Walker A, Baird PJ. The intrauterine treatment of fetal cardiac failure in a twin pregnancy with an acardiac, acephalic monster. Am J Obstet Gynecol 1983;147:842-4. 5. Robie GF, Payne GG, Jr., Morgan MA. Selective delivery of an acardiac, acephalic twin. N Engl J Med 1989;320:512-3. 6. Fries MH, Goldberg JD, Golbus MS. 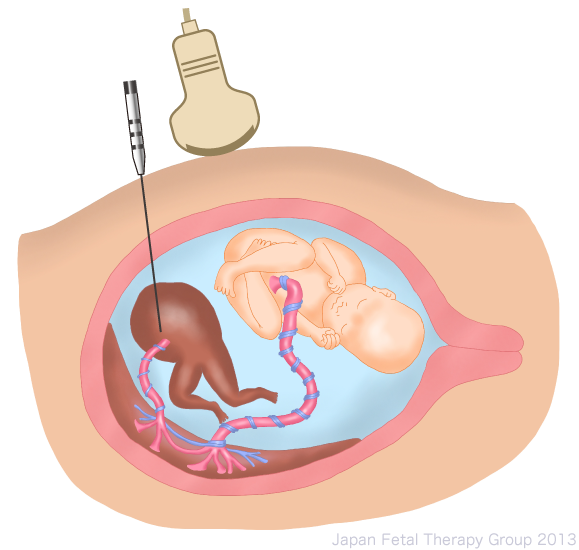 Treatment of acardiac-acephalus twin gestations by hysterotomy and selective delivery. Obstet Gynecol 1992;79:601-4. 7. Quintero RA, Romero R, Reich H, Goncalves L, Johnson MP, Carreno C, Evans MI. In utero percutaneous umbilical cord ligation in the management of complicate monochorionic multiple gestations. Ultrasound Obstet Gynecol 1996;8:16-22. 8. Ville Y, Hyett JA, Vandenbussche FP, Nicolaides KH. Endoscopic laser coagulation of umbilical cord vessels in twin reversed arterial perfusion sequence. Ultrasound Obstet Gynecol 1994;4:396-8. 10. Nakata M, Sumie M, Murata S, Miwa I, Matsubara M, Sugino N. Fetoscopic laser photocoagulation of placental communicating vessels for twin-reversed arterial perfusion sequence. J Obstet Gynaecol Res 2008;34:649-652. 11. Sepulveda W, Sfeir D, Reyes M, Martinez J. Severe polyhydramnios in twin reversed arterial perfusion sequence: successful management with intrafetal alcohol ablation of acardiac twin and amniodrainage. Ultrasound Obstet Gynecol 2000;16:260-3. 12. Chang PJ, Liou JD, Hsieh CC, Chao AS, Soong YK. Monopolar thermocoagulation in the management of acardiac twins. Fetal Diagn Ther 2004;19:271-4. 13. Hirose M, Murata A, Kita N, Aotani H, Takebayashi K, Noda Y. Successful intrauterine treatment with radiofrequency ablation in a case of acardiac twin pregnancy complicated with a hydropic pump twin. Ultrasound Obstet Gynecol 2004;23:509-12. 14. Hanmin Lee, Amy J Wagner, Edger Sy, Robert Ball, Vickie A Feldstein, Ruth B Goldstein, Diana L Farmer. Efficacy of radiofrequency ablation for twin-reversed arterial perfusion sequence. Am J Obstet Gynecol 2007;196:459e1-459e4.